Google Product Listing Ads (PLAs) have taken over as the predominant way to sell goods through the AdWords PPC platform. And Google keeps improving their PLA advertising product. Case in point, check out the new star ratings being delivered through Products Listing Ads. At first glance these are really great, but my guess is some advertisers might not like it. Let’s look at an example of the new star ratings below. 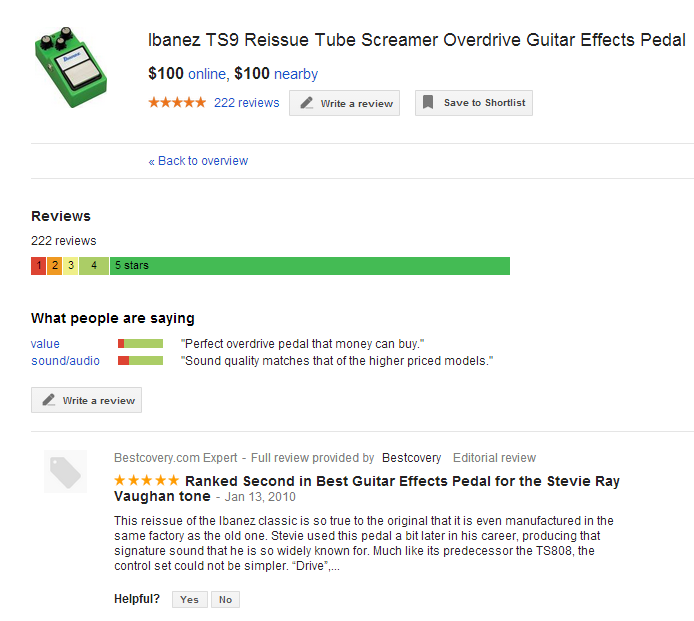 In this example, I did a search for the Ibanez TS9 Tubescreamer Pedal on Google. You can see my search triggered five different advertisers, each with their own product picture, and a few different prices. The next thing you may notice is that the star ratings and number of total reviews appear to be exactly the same for each advertiser. After further investigation, it becomes crystal clear: these are the same exact reviews being shown for each of the four advertisers selling the product. The reviews are actually scrapped from several sources, but we can see that in this case, Musician’s Friend has provided the lion’s share (97.7%!) of user reviews for the TS9. The problem is that Musician’s Friend’s work is being used to promote competitor offers by Sweetwater, Full Compass and zZounds. I could see this getting pretty dicey if Musician’s Friend is not found in the search results. In such as a case, Musician’s Friend is essentially providing the social proof of 217 voices to help move a competitor’s inventory! On the other hand, star ratings are great for the consumer. For example, a search for Fender Telecasters reveals 5 different products, 4 with separate user ratings. This might help me choose which link to click next. 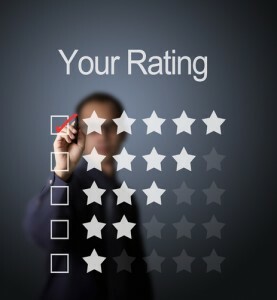 Star ratings in Google AdWords are nothing new. There have been seller ratings showing up in search results for years. But these seller ratings are much different than these product ratings. With seller ratings, Google aggregates data about customers’ experiences dealing with an individual reseller. This means each seller works to get their own reputation and have their own story told. Through these new product rankings, some resellers can easily piggyback off of the hard work of others. Further, Google hasn’t been exactly clear with its search users. I think someone could easily get confused – are these star ratings for the product or for the seller of the product? All old star ratings were for resellers, so it’s easy to assume this is the case in the PLAs as well since the star rating does appear right below the seller’s brand name. Now, I don’t feel too bad for Musician’s Friend. I imagine they have opted into this program since we don’t see other big players like Amazon.com in the product review mix. In fact, Amazon is probably done best active reseller eliciting and gathering as many user generated reviews as possible. But Google doesn’t seem to be scraping Amazon’s content, as 0 of Amazon’s 42 reviews of the TS9 make an appearance in Google’s reviews of this product. You can read Google’s official stance on new PLA star ratings here. So, what do you think about Google using product reviews in their PLAs? Do you think this will work out in Google’s favor, the Advertiser’s best interest or maybe a little of both? That’s good to know. I hadnt looked into how thess actually worked. Good find.